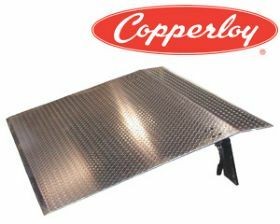 Dockplates are used in lighter capacity applications where low height differences exist and safety curbs are not necessary. Price includes heavy duty strap handles. FOB Shipping Point. Differential Leg Ht. Cap. (lbs.) Wt. (lbs.) Price Ea. More sizes and other options available - contact your dealer.